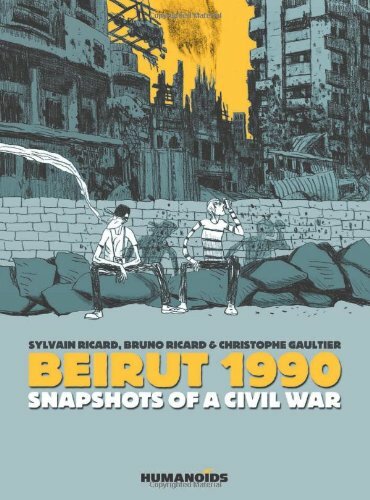 “Beirut 1990” is a graphic novel, in the similar genre as Guy Delisle’s popular travel diary comics. Originally in French,the book is published by Humanoids; a little known fact is that the legendary comic artist Moebius was one of the original founders of the publishing house. “Beirut 1990” tells the story of two brothers - Bruno and Sylvain - as they embark on a journey to Lebanon’s war-torn capital to help with aid relief. They come to discover life in a country torn by war and suffering, even as the people stoically live through it. There is no specific story structure and it can be hard to follow at times. One moment the brothers are fooling around in the garden and in the next moment, they are running for their dear lives as bombs fall around them. The stories appear random and the only unifying thread seems to be their youthful exuberance even as the civil war rages around them. Ironically, the brothers never get the opportunity to help with any direct aid relief effort, despite them making the perilous trip there. Christophe Gaultier is the comic artist for the book and I am a fan of his art.Some of the graphic novels he have done include “Phantom of the Opera” , “Robinson Crusoe” and “Gauguin”. Unfortunately, I cannot seem to find any of these graphic novels in English and fans will have to contend with just drooling over the artworks on the internet for now - until a publisher decides to translate his comics to English. For “Beirut 1990”, Gaultier employs a pencil style with just grey tones, which works well for the story. The lines are minimalistic and dynamic. He is able to caricature the mood of the people he draws superbly - cartoony at times, but in a stylistic way. The panels are well thought out and make up for any of the loss in the story structure. If you like graphics novels of the travelogue nature, you will enjoy “Beirut 1990”.